Today, Crown Princess Mary of Denmark celebrates her forty-second birthday. The Tasmanian-born princess has embraced the world of royal jewelry enthusiastically since joining the Danish royal family in 2004, and today, she wears a number of heirloom pieces from the family collection. 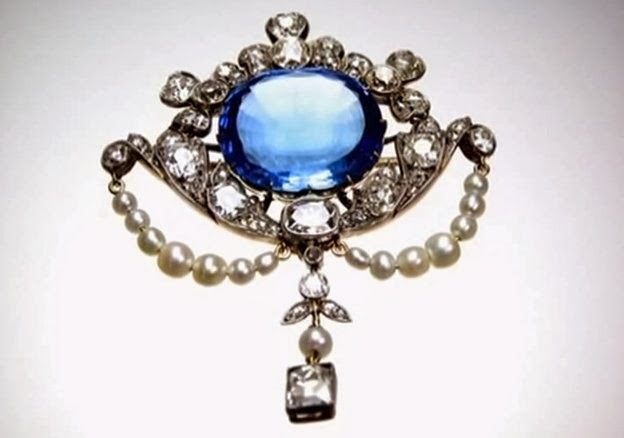 To celebrate her birthday, we're going to look at a small piece of jewelry that packs a major sentimental punch: her sapphire, diamond, and pearl brooch. The brooch features a large faceted sapphire surrounded by diamonds. Swags of pearls are suspended from the main element of the brooch, as is a floral diamond and pearl drop. The brooch can be traced back five generations in the family, back to Princess Louise Margaret of Prussia. She married the Duke of Connaught (one of Queen Victoria's sons) in 1879. Among her wedding presents was a sapphire and diamond brooch, given to her by Colonel Stannerly . The Washington Post describes the jewel as "a breastpin, with a sapphire set in diamonds" . Louise's brooch was inherited by her daughter, Princess Margaret of Connaught, who took it with her when she married the future King Gustaf VI Adolf of Sweden. At some point the brooch was apparently reset, taking on its current appearance; that would account for the pearls, which must have been part of a later addition to the piece. Precisely who had the jewel remodeled isn't clear. But it is clear that the sapphire brooch is one of the jewels that Margaret's only daughter, Ingrid, inherited and took with her to Denmark. Here the history of the brooch becomes clearer. Ingrid generally reserved the brooch for important occasions within the family. She wore it during the engagement celebrations for her eldest daughter, Queen Margrethe II, and Count Henri de Laborde de Monpezat. Eventually, Ingrid bequeathed the brooch to Margrethe, though the queen also wore the sapphire brooch during Ingrid's lifetime, specifically at the christening of her first grandson, Prince Nikolai, in November 1999 (see the photograph on the left). In 2006, Margrethe gifted the sapphire, diamond, and pearl brooch to Crown Princess Mary. It was a present to mark the birth of Mary's eldest child, Prince Christian of Denmark. Mary wore the brooch in public for the first time at Christian's baptism, which was held on 21 January 2006. Since then, she has also worn the same brooch at the christenings of her two youngest children, twins Prince Vincent and Princess Josephine (in April 2011). 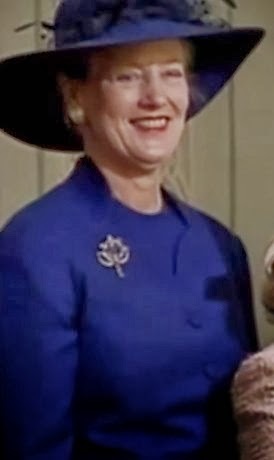 The brooch isn't the only wardrobe element that Mary has repeated for her children's christenings; Mary has also worn the same ivory floral headpiece at each of the them, including Princess Isabella's christening in 2007. While discussing the sapphire brooch during her interviews for De Kongelige Juveler, a wonderful documentary on royal jewels, Mary noted, "Some people learn history through wars or famous people, but jewelry is just as good a possibility to learn history. It shows how the families have married through the generations. And it doesn't only talk about lineage, but it also relates to personal events in families. For example, we know that this brooch has always been worn for family-related events. Except that now I have it, and I tend to wear it a little bit more generally" . 3. It's not clear exactly who this is referencing. Elsewhere in the Post list of Louise's wedding gifts, a Colonel "Stanley" offers two antique silver bowls; that Col. Stanley is almost certainly the 16th Earl of Derby (the Governor General of Canada for whom the Stanley Cup is named). It seems unlikely that the brooch came from him, as the two gifts are separated by a number of other entries on the list. If anyone can identify this "Colonel Stannerly," please let us know in the comments! 4. Published in the Washington Post on 14 Mar 1879. Ursula also includes a list of wedding gifts here. 5. Cropped still from a YouTube video; source here. 6. Cropped still from a YouTube video; source here. 7. You can view the first episode of the documentary here.